Here in southeast Texas, we don’t really get a ceremonial changing of seasons to signal that fall is (according to the calendar) here. We know by the crates full of pumpkins piled up outside the grocery stores, the first glorious bags of glorious grapefruit from the glorious Rio Grande Valley appear lined up next to them, and suburban front lawns are overtaken with a layer of pine needles and those gigantic inflatable Halloween decorations. There are pretty much no other signs of fall at this point, certainly not the thermostat of my black interior/black exterior car that lives in a sunny driveway (which, by the way, could really use that interior detailing that comes with an oil change… in another 1047 miles) just two zip codes north of the Seventh Circle of Hell. And while an endless supply of pumpkin and apple goodies (and grapefruit margaritas!) 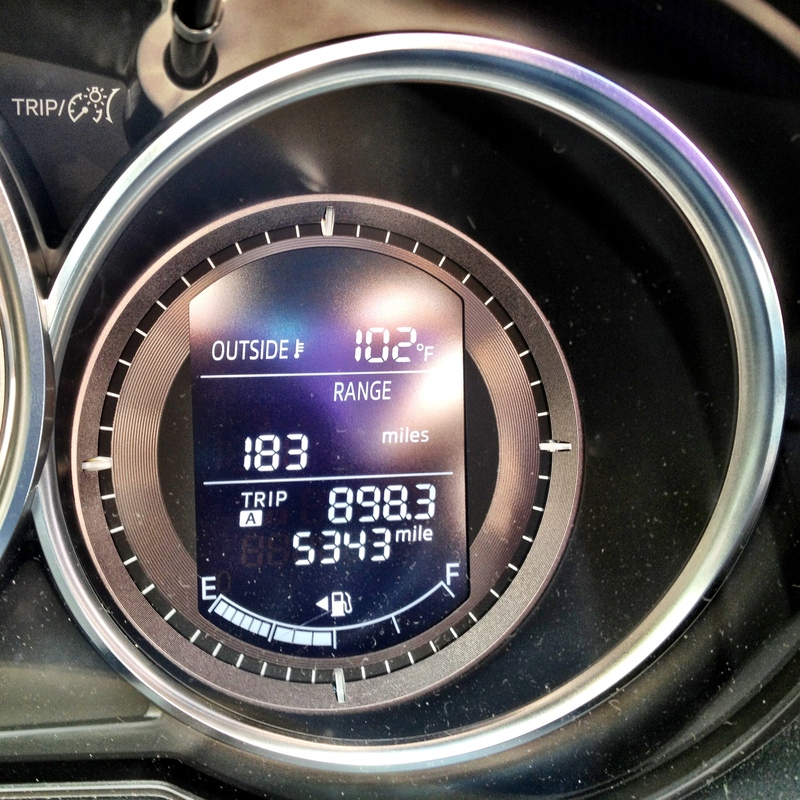 are great and glorious, next in line to start driving that “no really – fall is here! !” feeling home is the appearance of a particular sandwich at a local chain deli. But it oozes melty cheese and cream cheese (when they remember that I order it grilled, with cheese) and tangy cranberry chutney with every bite. It’s like having Thanksgiving leftovers in mid October, only without the 4 loads of after-dinner dirty dishes. And it makes me far happier than any sandwich not wrapped in money and Super Bowl tickets should. To whip up the sandwich at home, I added brie, omitted the cream cheese and red onion, and slathered generous amounts of a quick & easy homemade cranberry-apricot chutney (a sort of mash-up of these two recipes). No lopsided, assembly-line, lunch rush mess here! And bonus – the homemade cranberry-apricot chutney doesn’t cost nearly as much as the tiny jar from that shiny, gourmet kitchen store. Homemade cranberry-apricot chutney is the star of this turkey and brie panini. To make the chutney, heat olive oil in a sauce pan over medium heat. Add onion and pepper (if using), and cook ~3 minutes, until the onions have softened. Add the garlic and cook 1 minute more. Add the remaining chutney ingredients to the pan and bring to a boil, let cook covered for ~10 minutes until the cranberries have softened and then remove the lid and cook until nearly all of the liquid has cooked away, about another 10-15 minutes. Taste for sweetness and add another tablespoon or 2 of sugar, if you think it needs it (I was looking for just enough sweetness to take the edge off the cranberries). Let cool and then transfer to a jar or bowl and keep in the refrigerator (will last a good 2 weeks). To assemble the sandwiches, heat your panini maker or grill pan to high. Lightly brush the outside of the bread slices with olive oil and the inside with a generous smear of chutney. Pile turkey, brie, and salad greens on top and grill until golden brown. haha, I love how you describe Texas. I was born and raised in Dallas so I understand what you are saying. . dude, this cranwich (love that) is freaking stunning. O.M.G. Love it. That sandwich looks so good! 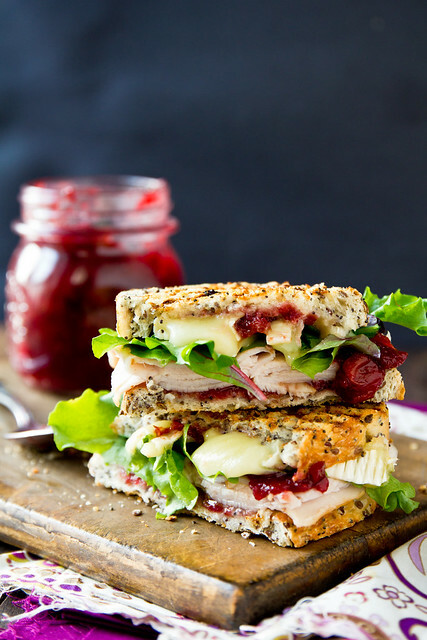 I’ve got a special place in my heart (& stomach) for grilled brie & chutney sandwiches, thanks to one of our local restaurants, so I have no doubt that turkey would be a lovely addition. I also can. not. wait. for some fresh grapefruit margaritas. I didn’t drink nearly enough of them last year. I can’t really imagine not having the signature cooler weather to hallmark the beginning of fall…but having this sandwich sounds like a pretty fair trade! 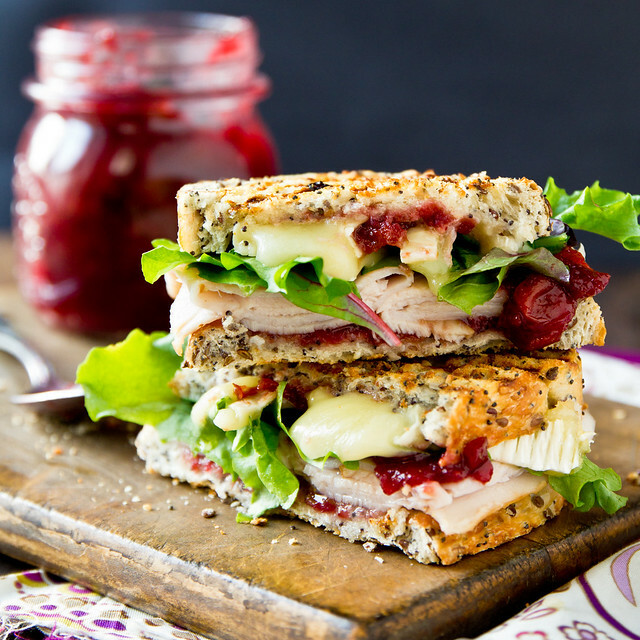 It’s precisely sandwiches like this one that make me wish I hosted Thanksgiving so I could enjoy the leftovers! It’s definitely fall here, but not too cool to have the heat on yet! I’m blown away by this sandwich and I think I could eat it daily even though I hardly eat sandwiches anymore. The next time I make homemade bread (because that obviously would elevate this to the next level), this is on my list! Your picture is stunning and I want to print it and display it in my kitchen! Gorgeous! Melty brie on a sandwich is pretty near nirvana. What kind of bread did you use? It looks so tasty. It’s the “3 Seed Bread” from the HEB bakery. It’s a grocery store chain. This looks SO good! YUM! I can see where it gets hard jumping on the savory and cozy pumpkin train when you’re in belting heat, but this sandwich totes works ANY DAY! I love brie and I love cranberries and I love this thing! These photos are absolutely stunning and mouthwatering!!! Will you come take my food photos for me?! Holy cow! What a gorgeous sandwich! I love all the flavors going on in there with the smooth brie and the tart but sweet cranberry chutney. That is my idea of a perfect lunch. I have never seen a prettier sandwich. For serious. ummmm, YUM. Pretty sure this will be lunch tomorrow. Me and turkey sandwiches = BFF. Especially when there are cranberries involved. Thanks for sharing! beautiful sandwich! Burst of colors and flavors! What local chain deli sells the Turkey Cranwich that inspired your MUCH BETTER version?? oh wow! that looks delicious! I love the pictures too! Not soft/smooshy bread – something that won’t completely flatten into a cracker under the pressure/weight of grilling. This looks like Thanksgiving in a sandwich! I am in love with brie and chutney – So beautiful! Looks so yummy, will be making this with our left over turkey at christmas. Just made the chutney and it’s so unbelievably good that I’ve been checking out your website for the last 45 minutes. It’s phenomenal and I haven’t even gotten to eating it on a sandwich with the turkey and brie yet ..though I’m bringing all the ingredients to my in-laws for Thanksgiving leftovers in just a few minutes. Wow this looks really good. However, what kind of bread did you personally use? I see the recipe calls for “sturdy bread” but the bread you used looks really good. It’s the “3-Seed Bread” from my grocery store bakery. This sounds absolutely wonderful! What a dance for the tastebuds! I still do not pretend to know what a chutney is! I once saw a recipe for hamburgers that called for tomato chutney. The big problem was, they did not give a recipe for the tomato chutney! Any ideas? I’m partial to the sun-dried tomato jam that you’ll find here (http://www.jasonandshawnda.com/foodiebride/archives/1057/) but I had a taste of this stuff (http://lizthechef.com/2012/06/27/tomato-chutney/) at a party and it was very, very good. With this being my 2nd fall in Houston from the midwest I totally gravitated to the turkeycranwich as my sign that fall has arrived in TX!! I went to that deli yesterday and paid about $10 forthe sandwich, a drink and some fruit. I blogged about the turkey cranwich yesterday and wanted another today but not willing to spend the $$$. This recipe might work if Iwren’t so lazy. Do you know where I can get the chutney already made? Oh My Good God – I think I have died and gone to sandwich heaven! I can’t get fresh cranberries here in Gran Canaria, but I made some yummy caramelised onion chutney at Christmas, so I think I’ll substitute that for your chutney, the rest of the ingredients I can pick up easily, so see you tomorrow Cranwich! I have just stumbled upon your blog via Pinterest and I can’t wait to have a nose around, it looks wonderful! Wow… these pictures are just really mouthwatering and beautiful. I would love to have a sandwich like this right now. This looks amazing and like the perfect healthy comfort food! Can I use dried cranberries? I haven’t made the chutney with dried cranberries but if you do try, make sure you start with more liquid to rehydrate. Hi there: Never been to Texas, have a friend from outside Galveston. No Matter, I had to pin this photo of your sandwich, didn’t even read the ingredients, it just looked SOOO good.. then I read the ingredients and almost fainted. cannot wait to try tihs.. awesome job!